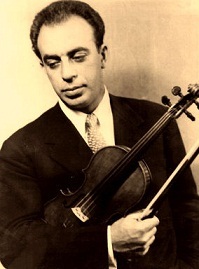 Berl Senofsky was a Russian violinist and teacher (most people would say American) born (in Philadelphia) on April 29, 1926 – one source gives his year of birth as 1925. He was known for his strong, focused sound and his strong convictions, whether on music topics or otherwise. He actually emerged from the ranks of orchestra players to become a concert violinist and teacher. Joseph Fuchs did essentially the same thing, though he spent many more years in an orchestra than did Senofsky. Senofsky began his violin studies at age 3, with his father, who himself had studied with Efrem Zimbalist and Mischa Elman. At age 6 (1932) he began studying with Louis Persinger, who was teaching Yehudi Menuhin, Ruggiero Ricci, Isaac Stern, Hermilo Novelo, Guila Bustabo, Camilla Wicks, and many other violinists at about the same time. According to one source, Senofsky also studied with Paul Stassevitch at the Mannes School of Music from age 9. Persinger began teaching at Juilliard (New York) in 1930. Senofsky may have been studying privately with Persinger since he did not enroll at Juilliard until age 12. From then on, his teacher was Ivan Galamian. Senofsky’s career was interrupted by World War II in 1944. However, after his brief military service, he made his debut in New York in 1946. He was 20 years old. He had by then won the Walter Naumberg Award, one of the top prizes for violinists. After further study with Galamian – an additional 4 years – he concertized for a short while. He first appeared with the New York Philharmonic on July 11, 1950, playing the Brahms Double concerto. The cellist on that occasion was Shirley Trepel. Senofsky eventually took a position with the Cleveland Orchestra in 1951, as assistant concertmaster. Joseph Gingold was the concertmaster at the time. He was there until 1955. In that year, he won the Queen Elizabeth competition in Belgium. From that point on, he concertized far and wide, focusing his initial (and extensive) concert activities on Russia. On January 15, 1959, he again played with the New York Philharmonic. The concert was repeated four times and the work he played was the Brahms concerto. With William Walton on the podium, Senofsky appeared with the same orchestra on August 8, 1963, playing the Walton concerto. On July 28, 1973, he was for the last time featured with the New York Philharmonic, performing the Scottish Fantasy by Max Bruch. He was 47 years old. From 1965 until 1996, Senofsky had a teaching job at the Peabody Conservatory in Baltimore. He was also concertizing around the world during all that time. Although he recorded for four (or five) different labels, Senofsky only recorded sporadically, but his recordings can still be easily found. A YouTube audio file is here. Among other violins, Senofsky played a 1771 Tomas Balestrieri violin which was later played by Ruggiero Ricci and a 1757 Carlo Landolfi later on. He loved playing chamber music but I could not find any mention anywhere indicating he actually played chamber music in public. A quote attributed to Senofsky goes something like this: "To me, music is a higher calling than just a profession or living. It is an effort in understanding something bigger than yourself--it is an effort at striving to be something bigger than you are. You can define religion that way too." Senofsky died on June 21, 2002, at age 76. Berl Senofsky was American, not Russian; he was born in Philadelphia. His parents were Russian. As for playing chamber music in public, he did it quite often. He even ran a chamber music series in Baltimore for 5-6 years, playing many of the major chamber works for strings and piano. Thank you so much for your informative comment Noel. You have enhanced the post 100% - I looked up so many sources and none mentioned any public chamber music activity. He also partnered with Gary Graffman, Ellen Mack, Artur Balsam, and many other pianists in recital and he had a piano trio for some years with Laurence Lesser and Ellen Mack. I knew Beryl in NY in the late 50's when I was a grad student at Columbia. Wonderful man.We both lived on the upper west side. One afternoon in spring of 1960 I believe, I ran into him on 93rd and Broadway and he told me he just got off the phone with Heifetz in Ca.and that Heifetz's last words to him were,"don't forget to practice scales,Beryl, or you'll play like Isaac" and that Heifetz referred to Stern as a "whore"! Isaac Stern was known to be arrogant and is even credited with stifling some promising careers. Perhaps he did have more than his fair share of influence. I appreciate your comment, especially as it brings to light what is known only on the "inside." I studied with Senofsky at Peabody where I had a chamber music class with him. Luckily I wrote in tiny pencil notes on the music all of his instructions and found them a few years ago. He looked at each passage and phrase from the point of view of whether it should be in tempo, or should push FORWARD slightly or LEAN BACK slightly as compared to the basic tempo. He told a number of hilarious stories about George Szell and other musicians. The best was about how Szell told his orchestra he was going to make a fool out of Heifitz when Heifitz came to play the next week with Szell's orchestra. But Heifitz instead effortlessly turned the tables and made a fool out of Szell. At the rehearsal, when the orchestra had just finished the lengthy exposition of the concerto and Heifitz was about to come in, Szell stopped and said to the orchestra, "Let's go back through that again." Heifitz said quietly, "Let's not," and started his entrance in the piece. The whole orchestra followed Heifitz, leaving Szell standing there. Thanks for Heifitz' comments on Stern. I always thought much the same about Stern although my instrument is the piano, not the violin. Thank you for this wonderful "inside" story. If you read my little profile of Guila Bustabo, you will find a comment from someone who was actually her stand partner in the Alabama Symphony. His knowledge of her history there is fabulous, especially since the press is given to making uninformed, incomplete, and misleading assessments of Ms Bustabo's career. Thanks again!!! I was only 19 years old and studied with Beryl's father in Brooklyn -- Max Senofsky, a truly wonderful man who I will never forget. He never forgot to tell me how proud he was of his son. I was even lucky enough to purchase tickets in 1950 to hear Francescatti play the Beethoven in Carnegie Hall and took my dear teacher with me. I am just writing this note to remember and tell you how fortunate I was. Thank you for your great comment. All of us who love classical music and great violin playing are fortunate indeed. Interesting how various people will have various impressions, obviously based on their interactions & events in their lives. When I was in high school, say about 1961, my first-cousin Beryl Senofsky was playing a concert in my home town, Jacksonville, FL. He stayed in our house and, that afternoon, before the concert that evening, he & I were throwing football back & forth. When my father came home from work, he was aghast to learn that his nephew Beryl & I had been throwing a football to each other, with the concert violinist potentially putting his fingers in "violin-playing jeopardy" -- even more upsetting due to the fact that Beryl was scheduled to perform just a few hours later. Thirty-five years after that, in 1976, Beryl was playing a concert in Orlando, and I was living at that time in Jacksonville. I drove down to see him in concert & to say hello. After the program, I went back stage, and knocked on his dressing room door. A man in a tux answered the door, and went to get Beryl. The dressing room was filled with VIP well-wishers. Beryl came to the door, poked his head out without actually opening the door much more than shoulders-wide, chatted briefly with me for about 15 seconds, asked me to extend his regards to my parents, and then promptly disappeared back into the dressing room & the embrace of those well-wishers, leaving me more than a little dumbfounded at the closed door. So much for driving 140 miles each way, and spending 3½ hours in my car to greet an older, distant first-cousin I had held in high esteem. Thank you for this incredible anecdote. My violin teacher told me a very similar story regarding Spivakovsky. It's been said that Heifetz used to hang up the phone on people calling his house if they didn't recognize his voice when he answered.